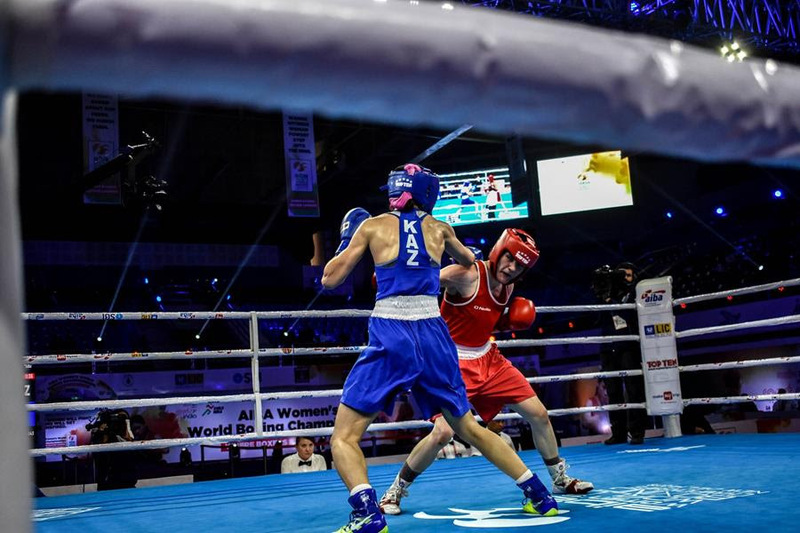 Day 1 of Semi-Finals revealed the first ten boxers standing just three rounds away from gold after Thursday saw action taking place in Light Fly (48kg), Bantam (54kg), Light (60kg), Welter (69kg) and Light Heavy (81kg) at the 2018 AIBA Women’s World Championships. A packed Indira Gandhi Sports Complex witnessed the impressive performance of all boxers proving the immense talent of these generation of boxers. The remaining ten Semi-Finals will take place tomorrow starting at 16h (GMT -5.5) and fans across the World will be able to watch them live on aiba.org. If there is a country which has dominated the Light (60kg) category in the history of the AIBA Women’s World Champioships, this country has been Ireland with the Irish superstar Katie Taylor, who clinched no less than five World Championships. And today’s action saw Taylor’s heiress Kellie Harrington reaching her second consecutive World Finals, first one in the Light (60kg) category, after defeating Kazakhstan’s Karina Ibragimova by unanimous decision. Harrington is now only a victory away from the glory and will be facing talented Thailand’s Sudaporn Seesondee on Saturday’s Finals in New Delhi. Thursday action at the Indira Gandhi Sport Complex saw the first ten thrilling Semi-Finals bouts in a day to remember in New Delhi. A total of 8 nations have now progressed into the Finals with China and Chinese Taipei leading the table with 2 boxers qualified each. Among the other six countries, the likes of Ukraine and Colombia have reached the final stage for the first time ever in what promises to be one of the most disputed Finals of all times. Even if Mary Kom’s trophy cabinet is already packed with medals from every single international boxing event, the AIBA Legend is clearly looking to add a new AIBA World Championships gold. Inspired by a packed arena cheering her name across the three rounds, the 35-years-old Indian star delivered a well-rounded performance against one of the biggest surprise of the event, People Republic of Korea’s Hyang Mi Kyang, to reach a new World Final on her route to tie with the Cuban Legend Felix Savon as most decorated AIBA boxer of all times.